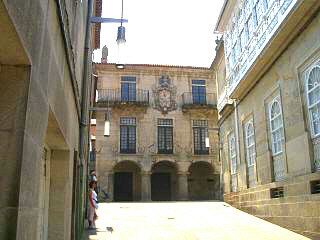 The first thing that we noticed about Pontevedra was that it was not especially clean. Furthermore a pervading odour, we had been warned about, seemed to be ever present. There was however an explanation for both these negative initial impressions. The previous night had seen a major festival, of which wine was the star player, and the smell was nothing more than "vino" spillage in the streets and plazas. The litter too could be put down to the festival, we were in fact in August and in the middle of Pontevedra's fiesta season and mass tidying up takes place once all the celebrations are completed. The smell that we were warned about is cellulose from a local paper pulping factory and can apparently be quite unpleasant. Whether it was masked by the smell of wine, or simply not that strong, we never discovered. So what were our lasting impressions of Pontevedra? The best way to sum up Pontevedra is to say that, unlike Galicia's Lugo, we were amazed at how appealing all the photos we took of this city made it look after the fact. When we walked around and explored Pontevedra, we could not help but be impressed by many of its buildings, its attractive squares and the busy atmosphere, but the city as a whole was messy and did not live up to our (high) expectations. There was no clearly defined old town, or if there was it had many newer and less aesthetic buildings mixed in with the older ones. The alameda was somehow dull and bleak and dominated by two massive buildings that both overlooked and overshadowed it. That said, Pontevedra is a city in which you can easily pass away a day, it has some attractive areas, especially some of the older squares and a large multi building museum that we never got around to visiting. In looking for excuses as to why we did not like Pontevedra that much, it is hard to come up with an obvious explanation. It was a hot sunny day when we visited, we managed to get parked up quickly and cheaply and found two tourist offices almost immediately. Perhaps we expected too much, or perhaps the fiesta litter tainted our view of the place. 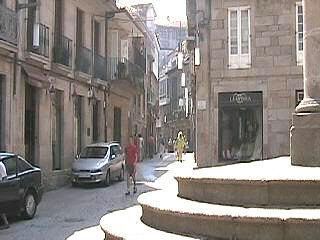 That said, we would definitely visit Pontevedra again. If you are staying close to Santiago de Compostela, Pontevedra is a good hour away by toll road, but takes less time to reach than Lugo, A Coruna or Ourense. If you intend to visit four or five of Galicia's major cities, then Pontevedra should certainly be on your agenda, but if time or traveling restrict you, make sure you place it behind all those just listed. A journey to Lugo or Ourense will probably prove more rewarding, at least in our opinion.